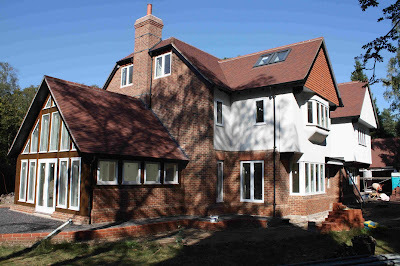 This is a house i designed and got planning for a couple of years ago and having visited the site yesterday, i am pleased to say it is all looking great…. The site is just around the corner from Ascot Racecourse and sits on a prominent corner plot and was within Green Belt Village designation so we had a few hoops to jump through. 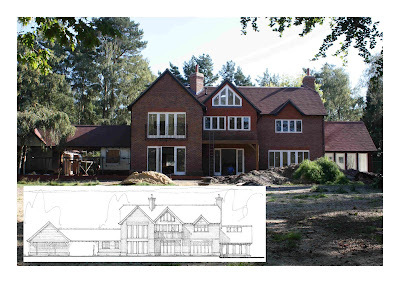 This project is on behalf of a good developer client based in Virginia Water and i have now designed around 10-12 houses for them, all of which have been constructed. I will get some more shots in a couple of months once the site has been tidied up and things have progressed a bit more on the finishes…. This is a project i have been working on for a while now but between myself and the clients and a lot of hard work, we have now got the planning approval! 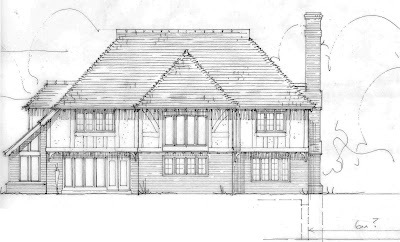 Its a replacement dwelling project in a very nice private estate although the current house is ok, this new design is going to look absolutely amazing and i cannot wait to see it built. The plot is the first one as you enter the estate so will take pride of place. It is going to be a an oak frame supplied by our very good friends at Oakwrights and we will keep you updated with progress as and when things start moving. Congratulations Doreen and Russell…. , we got there in the end! 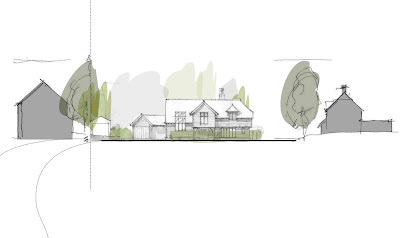 We have received planning permission on behalf of these clients in an amazing location…. 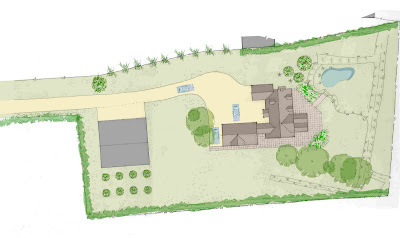 The project is a replacement farmhouse in the Cotswold district and within an Area of Outstanding Natural Beauty. We worked closely with the planning authority at pre-application stage as this was always going to be a high profile site with 360 degree panaromic views of open countryside. The great news is that we got the planning permission first time with no problems and received a good response to the design and its placing within the open landscape. This is going to be another project with our friends at English Brothers and will be built to Passive House standards with the client aiming to reach Level 5 of the Code for Sustainable Homes. The specification includes solar PV heating to run the whole house as well as rainwater harvesting together with significant tree planting and the creation of a bio-diversity pond. We also had to include the construction of a new bat roost to replace what was found within the existing dwelling. Congratulations Mark and Sonia, …. you now have a house to build! 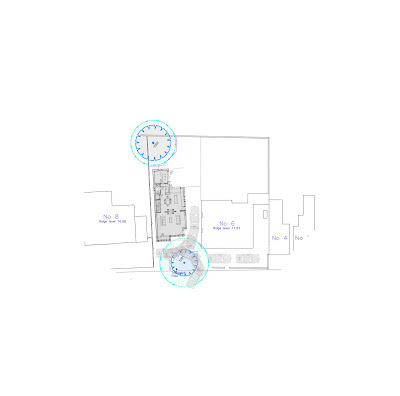 It was on a tight site within the village Conservation Area and had very restrictive vehicle access and parking requirements but following some good pre-app communications with the relevant officers at NHDC, we got it passed first time, no problems. Congratulations Adam and Vicki…. bet you cant wait to start building now! This is a really nice design i did for clients in East Sussex. Check out the link for full design story and also frame and build shots. Congratulations Martin and Patti… looks like you did it!